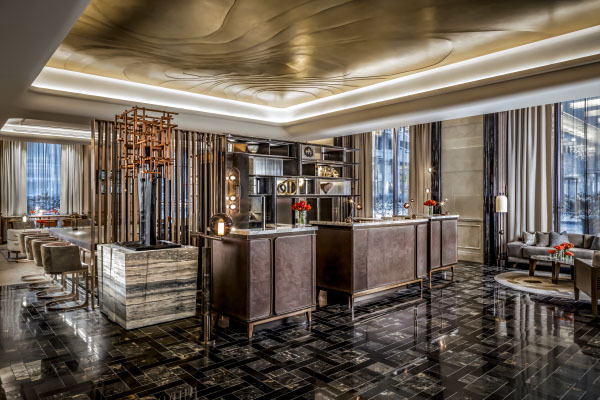 St. Regis Hotels and Resorts announced today the highly anticipated opening of The St. Regis Toronto, marking the iconic luxury brand’s debut in Canada. Owned by Innvest, the landmark hotel is set to elevate Toronto’s luxury hospitality landscape with its world-renowned bespoke service, signature rituals and exquisite culinary offerings. Rising 65-stories above Canada’s international enclave for business and culture, the hotel is a beacon on the Toronto skyline, offering visitors a remarkably central location between the entertainment and financial districts. Within close walking distance from preeminent shopping, live theatre, sports and entertainment venues, the hotel places guests just moments from the city’s most distinguished landmarks including the CN Tower, Union Station, Toronto International Film Festival, Scotiabank Arena, Hudson’s Bay Company and Saks Fifth Avenue. Boasting 258 spacious guest rooms, including 124 luxury suites – the most suites of any luxury hotel in Canada – modern elegance and bespoke service come together at The St. Regis Toronto. Designed by DesignAgency and Chapi Chapo Design, the hotel reflects the layered and diverse cultural history of Toronto, the unique landscape of the Ontario province, and the rich social fabric of the people that make up the city. Guests will enjoy the brand’s signature St. Regis Butler Service, which offers unparalleled, around-the-clock service and customizes each guest’s stay according to their tastes and preferences. This hallmark service includes unpacking and packing, beverage service and garment pressing. The hotel will also introduce eButler chat – where guests can contact their Butler through the Marriott Mobile App, available 24 hours a day. An exciting addition to Toronto’s ever-evolving food scene, the hotel will unveil two unique culinary venues to the city, including LOUIX LOUIS, grand bar and restaurant on the hotel’s 31st floor, and Astor Lounge, a lobby-level café lounge. Helmed by Executive Chef Guillaume Robin, LOUIX LOUIS offers a menu of contemporary American cuisine with French technique. The dramatic crystal glass interior design draws inspiration from the iconic cocktail bars of New York and Paris, while infusing Toronto’s history as the largest distillery in the world. The first of its kind in Toronto, the two-storey grand bar offers an extensive spirit list, including one of the deepest dark spirit collections in the country. LOUIX LOUIS also provides a second-level loft space available for private bookings and an outdoor secret garden overlooking Toronto’s skyline and Lake Ontario. The St. Regis’ signature Bloody Mary cocktail has also been given a local twist at LOUIX LOUIS. Named the “Rouge 140” the cocktail pays tribute to Toronto as the most multicultural city in the world, with over 200 cultures and 140 languages spoken. With flavors including soy, oven roasted red pepper, tomato juice, chili, and a special blend of spices, a multitude of flavors from the various cultures represented in Toronto are featured in the Rouge 140 to honor the people of the city. The hotel lobby will house Astor Lounge, a café counter and living room-style space that will serve Afternoon Tea on weekends and transform each evening with a brand ritual of champagne sabering at 5:00 pm for seated guests. The St. Regis Toronto’s thoughtfully designed 12,000 square foot event spaces can accommodate gatherings of all kinds, from executive meetings to extraordinary celebrations. Dynamic 30th-floor meeting rooms offer sweeping views of downtown and can be custom-tailored with St. Regis and Astor Ballrooms connecting via a grand staircase on the 9thand 10th floors. The hotel also offers guests the opportunity to escape to Canada’s highest urban luxury oasis at the Spa at The St. Regis Toronto. Located on the 31st and 32n d floors, the Spa includes an infinity-edge saltwater lap pool with beautiful panoramic views of the Toronto skyline and state-of-the-art fitness center on the 32nd floor featuring a movement studio for yoga and pilates.